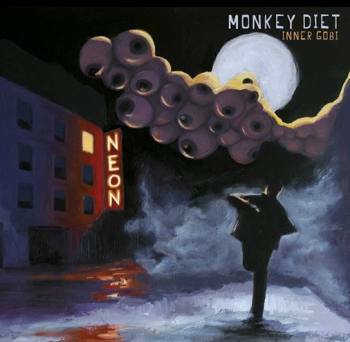 Monkey Diet is the outcome when you put the former bass player of Italian jazz rock band Accordo Dei Contrari, a psychedelic progressive guitar player and a drummer for a Genesis tribute band all together, with the goal to create music that is purely improvised. Inner Gobi is the first result of the co-operation of those three musicians. When the reference is a complete improvised album, thoughts swiftly go to projects like Liquid Tension Experience, Attention Deficit or more lately, some of the Moonjune recordings. Monkey Diet has a bit of both I guess. Guitar player Gabriele Martelli is more an inventive fusion player as he is the ultimate progressive metal shredder. Bass player Daniele Piccinini does have some Tony Levin chops up his belt and drummer Roberto Bernardi is both a steady drummer as well as adventurous in his rhythmic playing. But still the overall impression is that we get to listen to a real band, more than during some of the aforementioned projects, which sounded a bit “forced to be creative”. Sometimes the progressive music shows some hunches of post rock, like in Sorry Son...(I've Lost Your Car) or Slidin' Bike. But the majority of the tracks are nice and melodic and although the focus mainly goes to Gabriele's guitar , both Roberto as well as Daniele do get enough attention and get the chance to show their skills. The track Moth has a vocal minded intro, which does add a special touch to this tune. Similar extra's would have been nice to spice things up and take away the serious undertone of the compositions. The final track; Viking is a very pleasant sounding track, only the last three and a half minutes are kept in silence, except for a final comical outburst. Inner Gobi turned out to be a very interesting album, both fusion aficionados as well as instrumental progressive rock fans would find some of their likings here. For me Inner Gobi has that nice intensity that will bring them on the right path towards a band like LTE. Well done.